Keep Your Good Thing Going w/EVEN Hotels — . I’ve said this many times before and I’ll say it again, I rep a life of consistency because I am tired of chasing my fitness tail. I was once the queen of the crash diet, hours in the sauna and 3 a day workouts to try to get an edge for a photoshoot or audition. Sure, I’d look great when the big day came but I was exhausted, my skin was dulled and I’d binge immediately after erasing all that I had worked for. Today I truly know the importance of making one good decision at a time but more importantly, having a realistic approach to fitness and never forgetting to experience life. One of my favorite ways to live life to its fullest is to travel. As a professional dancer I’ve been so lucky to travel and perform around the world. It has truly shaped who I am and how I relate to each and every person I meet. For most, traveling means falling off the wellness wagon for one of two reasons- indulgence and lack of convenience. Whether you’re away for work or pleasure, a bit of indulging is essential. What has life become if you can’t have a glass of Bordeaux in Bordeaux, chocolate in Switzerland, or a cheese steak in Philly? As for convenience, I get it. When you’re away from your normal fitness regimen you don’t have access to what keeps you on track. It’s convenient NOT to work out when the hotel fitness center is sad and your vending machine options are Snickers or starve. It’s easy to make choices you’d never settle for at home when your accommodations give you no other option. Enter EVEN Hotels. EVEN is for the wellness minded traveler and the opportunities for healthy choices are everywhere. They recently invited me to their new location in Seattle to get my take on all they’ve done to help #KeepYourGoodThingGoing wherever you are. They (really) encourage you to keep active. Hands down the most impressive feature in this hotel are the in-room workout stations. There is a resistance tower with various bands and loops, a weighted medicine ball, yoga mat, block and foam roller for your use. Better yet, there is an entire catalogue of workout videos on your TV ranging from 5-20 minutes to follow along in the privacy of your own room. 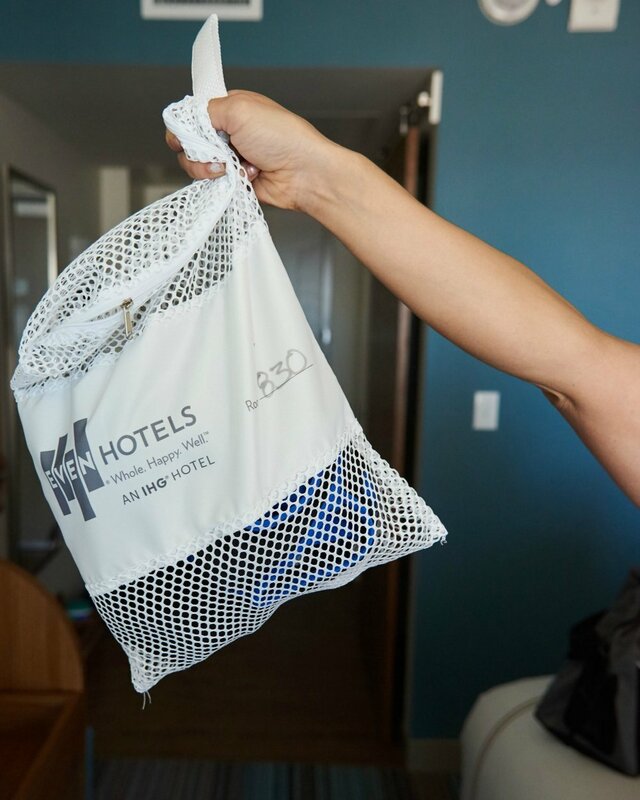 They also offer free workout clothing laundry with your daily house keeping service so you can pack light and hit it hard the next day. This is an amazing feature because can't tell you how many leggings I've washed with shampoo in hotel bathroom sinks! EVEN’s fitness center is on par with the current fitness landscape. They have TRX, brand new bikes and treadmills plus a quiet room to flow your heart out. Their gorgeous outdoor terrace gives you plenty of room to stretch outside or play giant Jenga, Connect 4 or Corn Hole. You have the option to keep it clean and eat well, if you so choose. The hotel market’s menu at Cork and Kale provides endless protein heavy options to jumpstart your day. The veggie frittata and power board with hard boiled eggs and turkey bacon were my favorite. As you know, my policy for diet is to keep it squeaky clean while at home so you can indulge while you're out. I loved that I could maintain this way of thinking while calling EVEN Hotels home. 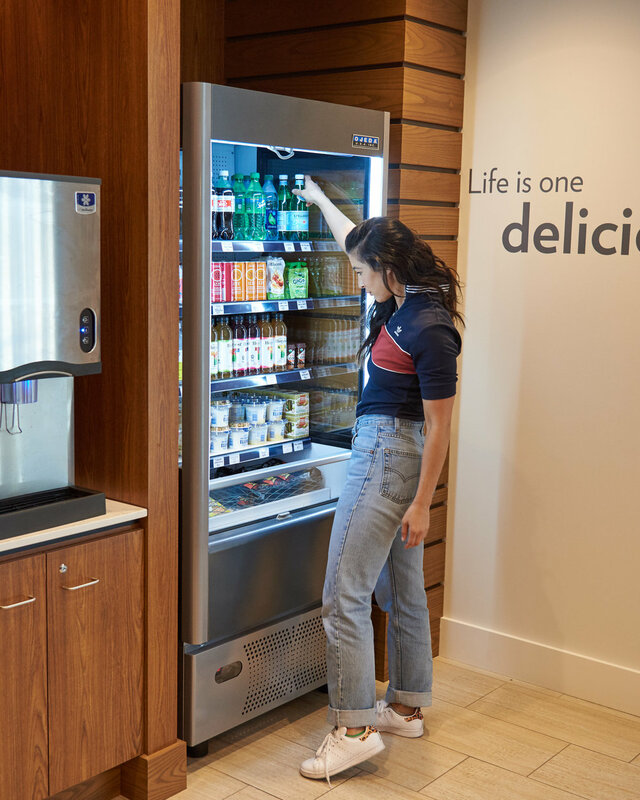 You can also stay hydrated and eco friendly because EVEN provides a reusable water bottle for your use and filtered water stations on every other floor. No more recycling plastic bottles and trekking to the fitness center to fill up! If this all seems a bit much and if you’re thinking “like I’d ever use or eat that stuff,” don’t forget that any effort counts. What if you sat on the medicine ball while answering emails, rolled out your calves after adventuring all day or grabbed iced tea over a soda? Every ounce of self care does not go unnoticed when it comes to your health. Whether you’re on vacation and ready to throw it all out the window or traveling for work and eager to stay focused on your healthy regime, EVEN has your back. The opportunities to make one better choice at a time surround you- in your room, on your floor, downstairs at Cork and Kale and hitting you as soon as you walk in with lime and ginger infused water. It’s not required to eat lean and work out seven days a week but the point is if you wanted to, you can. Feel better, have more energy and accomplish more while staying at EVEN Hotels. Thanks so much for inviting me up, showing me around beautiful Seattle and introducing me to some amazing women! Read other reviews of our trip to Seattle and stay at Even Hotels from Joanne Encarnacion and Sadie Sabin, two women who inspire me everyday!